This cake was made for my nephews 12th birthday. He loves the outdoors and fishing. The cake itself was a chocolate cake with cream cheese frosting. The pond water is blue frosting. 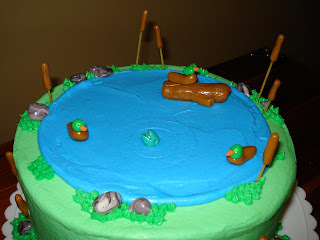 The cat tails were made from spaghetti noodles and brown fondant. 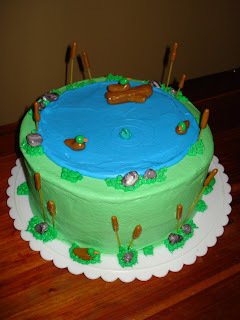 The animals and objects (ducks, fish, turtle, rocks and log) were all handmade using fondant.